Ourlads’ Football Network host Greg DePalma and RotoExperts.com managing director Scott Engel get together each week to discuss who’s hot, who’s not and who’s hurt in fantasy football, as Scott offers start/sit advice and top targets for pickup. Full analysis from Scott and his colleagues can be found at RotoExperts.com. 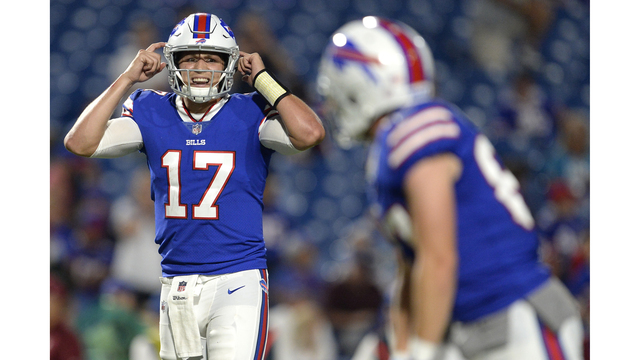 Josh Allen, Bills: Rookie mistakes and an October injury prompted many to bail on Allen, but he’s worth a flyer for anyone needing to replace Andy Dalton or Blake Bortles. His passing stats won’t dazzle – 8 completions last week – but he scores points with his legs. Bills brass will give him latitude, and Allen also draws a set of dicey December defenses in the Dolphins, Lions and Patriots. Rex Burkhead, Patriots: Freshly returned from injured reserve, Burkhead’s versatility will get Bill Belichick and Josh McDaniels finding ways to get him touches. Sony Michel (runner) and James White (receiver) are one-dimensional players who rarely stepped on the field together. Burkhead can pair with either and create some defensive guesswork. He’ll also score a few TDs. LeGarrette Blount, Lions: With Kerryon Johnson sidelined by a knee sprain, Blount went out on Thanksgiving and picked up 88 yards vs. a pretty stout Bears defense. As long as Johnson’s status remains cloudy, Blount is a valuable “handcuff” who figures to get a steady workload in the event the starter goes down. There’s still some fuel in the tank. Nyheim Hines, Colts: The same “handcuff” strategy comes into play for the Colts, where top RB Marlon Mack is going through concussion protocol. As Andrew Luck has gotten into a rhythm again, the run game has become an efficient counterbalance. Though Hines may have to share touches with Jordan Wilkins, recent usage shows Hines to be the busier option. Adam Humphries, Bucs: Toiling in the shadows of DeSean Jackson and Mike Evans, Humphries has quietly gone out and pulled in 26 receptions and four TDs over his past five outings. Those numbers have come regardless of who’s been slinging it – Jameis Winston or Ryan Fitzpatrick – and the desperate Bucs aren’t in any position to change their ways. Chris Herndon, Jets: Herndon has been featured in this space before, but he’s still overlooked in far more leagues than he’s taken. Considering the difficulty of finding reliable TE production outside the Kelce/Ertz/Gronkowski axis, that’s a bit of a surprise. Herndon has been worth double-digit fantasy points in four of his past six games, despite the Jets’ overall malaise.